From season to season the Thomas Center gardens provide a cool oasis to escape summer’s heat and sunny areas to escape winter’s chill. Colorful camellias brighten mid-winter followed by the vibrant azaleas of early spring. Late spring sees the white blossoms of dogwoods and beautiful roses usher us into summer. Throughout the gardens, ferns and palms provide a greenery backdrop to majestic live oak and magnolia trees. Take a virtual tour of our gardens by clicking on the numbers below. Central to the garden’s design was the original fountain from the Hotel Thomas days. A circular plaza around the fountain, framed by nearby live oak and magnolia trees, was designed to make the fountain an impressive focal point. Diagonal walkways laid out in keeping with the buildings’ Mediterranean Revival style architecture radiate from the central plaza, establishing “sight lines” that draw visitors to the garden features. East of the Central Plaza is one of the main entry-ways to the historic cultural center building. The stairs are flanked by two statuesque dog sculptures known simply as “the Whippets.” After an earlier pair of whippets disappeared, these two replacement sculptures, cast from the original mold, were donated by Reed and Sarah Brown. This lovely outdoor theatre, tucked between Buildings A and B, was once just a stormwater retention area. With a generous donation from local philanthropists Grace and Sidney Knight, landscape architect Buford Davis transformed the neglected space into a beautiful and useful community asset. The bowl-shaped area became a small-scale terraced amphitheatre, and a stage platform was created adjacent to the breezeway connecting Buildings A and B. The design included a lead wall sundial with a bronze gnomon (or sundial pin) and locally handmade tiles on the built-in benches. The theatre was dedicated in 1986 as a golden wedding anniversary gift to the community and celebrated with the premiere performance of Romeo and Juliet. 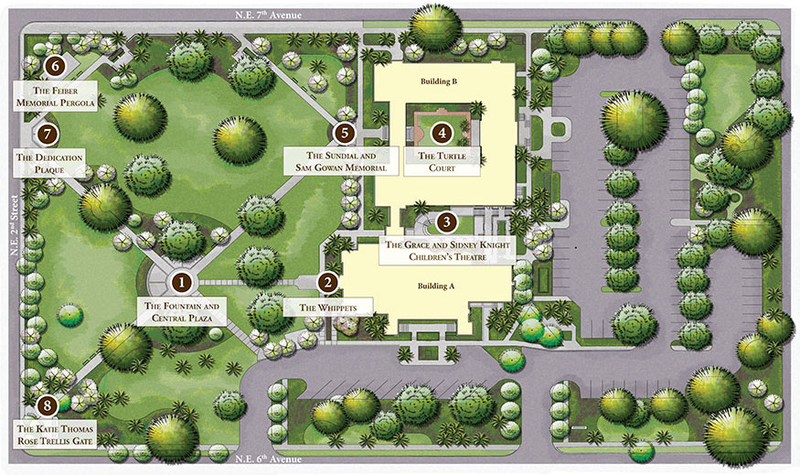 Named for its central fountain in the shape of a large turtle, this grassy courtyard is located between the two wings of Building B. In the days of the Hotel Thomas, guests and townspeople alike enjoyed social events in this pleasant spot. Today it is still a popular location for weddings, parties, and receptions. This striking armillary sphere sundial, donated in 1986 by the Gowan family, terminates an important “sight line” from the Turtle Court. Two Washingtonia palms stand like tall sentries as visitors cross the arcade from the Turtle Court to the sundial. Across from the sundial is a memorial plaque for Sam Gowan who was the energizing force behind the “Save the Thomas” movement in the early 1970s when demolition of the site seemed inevitable. At the garden’s northwest corner is a graceful pergola, an open-roofed arbor supported by Tuscan columns. Designed for quiet reflection, the structure encloses curved benches and provides a vantage point from which to view the entire gardens. It was built in 1996 in memory of Thomas Feiber who began the restoration and re-use plans for the gardens. The pergola was designed by landscape architect Buford Davis who continues to be involved in the ongoing process of maintaining and restoring the gardens. Near the Feiber pergola is the dedication plaque erected in 1989 when the gardens were dedicated. The plaque recognizes the community leaders and civic organizations that contributed to the gardens’ restoration. It also marks the northwest entry point into the gardens, which are enclosed on the north and west sides by a capped perimeter seat-wall. This low wall defines and delineates the space while allowing pedestrian views into the gardens. At the southwest corner of the gardens, this entry gate pays homage to Major Thomas’s wife, Kathryn (Katie), and her love of roses. Mrs. Thomas maintained over 300 rose bushes in a large garden north of the porte-cochere and in the atrium (now the Spanish Court) of the original Sunkist Villa estate. This gate of wrought iron fencing and stone piers functions as an entry point into the gardens from the surrounding neighborhood.